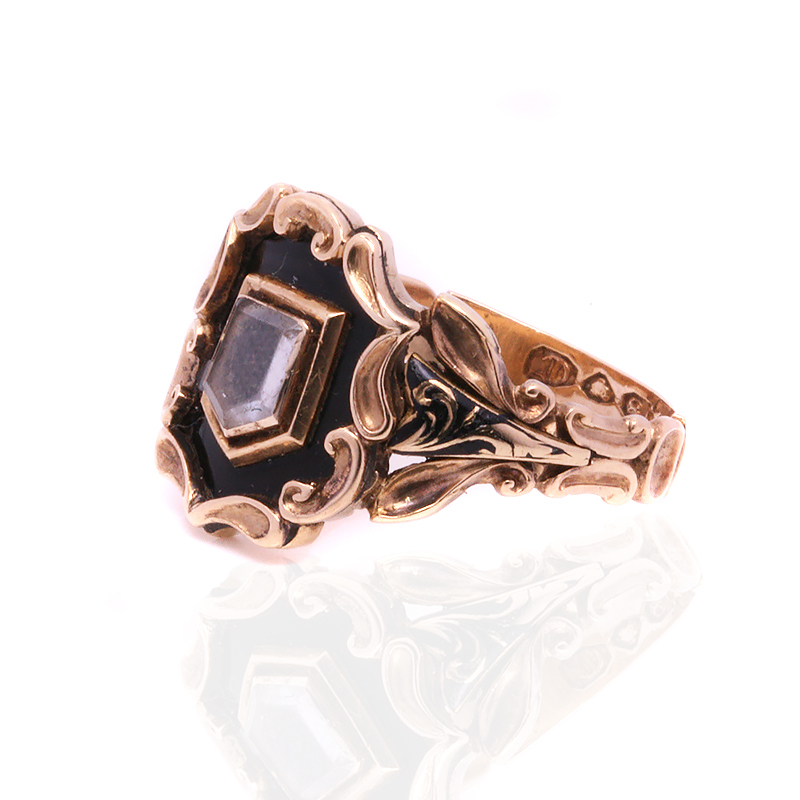 Product code: ES7859 Categories: Antique, Antique Rings. While many people look at mourning rings as being morbid, they should be looked upon as poignant and indeed a beautiful way to remember someone such as this 18ct antique mourning ring made in London in 1838. Made in an era where to remember someone was to often have a keepsake made, this mourning ring was beautifully hand made in 8ct gold and highlighted with black enamel. Although it is not just the black enamel that is beautiful, it is also the incredible scroll work design as elegant enamel work on both sides of the band. Then sitting in the centre of the shield shape at the top and protected under a cover of clear rock crystal, is a lock of woven hair making this mourning ring even more special and is a real testament to the quality of this ring for it to last all these years. And then turning the ring over and looking at it from underneath, makes this ring even more personal. It was hand engraved with “In memory of Mary ob 9 Oct 1852“. 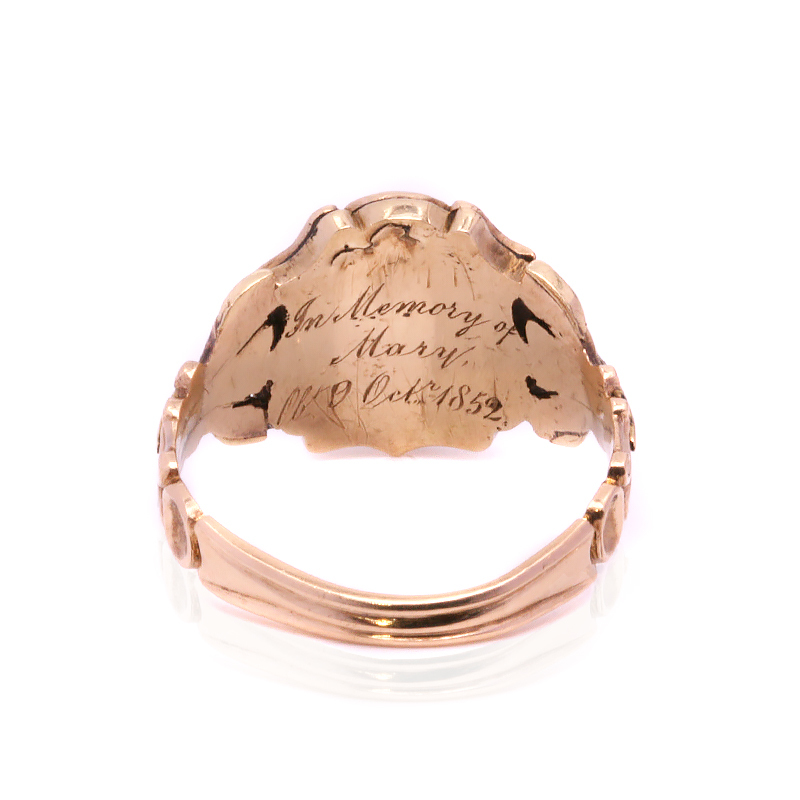 It is a lovely inscription such as this that makes a mourning ring so much more personal and special. Measuring 14.3mm across the long section of the shield, this is such a beautiful antique mourning ring that is perfect for any collector. A lovely antique mourning ring from the start of the Victorian era.